In the modern world, many people love to travel and find out about new places. Whether it is Rome, Bangkok or London, there are so many fabulous places to visit around the planet. Unfortunately, the issue for many would be travellers is that they do not have the money to visit all of the fantastic locations they would like. Rather than give up the experience completely, they look to others who have been there to show them what it is like and what sights and sounds they could see and hear when visiting. That makes posting information about your travels on social media a big deal. Many do so on a personal level, purely to show their followers what they have been up to recently and to share fun content. Others will actually make a business from this kind of travel reporting. By posting information about their latest adventures on social media, they can help to build up their brand presence and drive traffic to their main website. But what is the best way to let people know about your travels via social media? When posting information about travels, video content is the best medium to use. Video is becoming huge in social media terms. The popular video sharing site YouTube for example has around five billion videos for its millions of users to view. When you also see that Twitter posts with video content get up to six times more re-tweets, it is clear to grasp why many social media users are using video. But how do you create the best video content to post? Here are some great tips to help you out. Use a professional online solution – Facebook is a social media giant with over one billion active users. To make Facebook video content that reaches more of the users, you need to find a way to make videos of a professional standard. The best way to create this sort of content is with online solutions that help you get quality results, fast. Many are free to sign-up with and will enable you to produce videos that people actually want to watch. 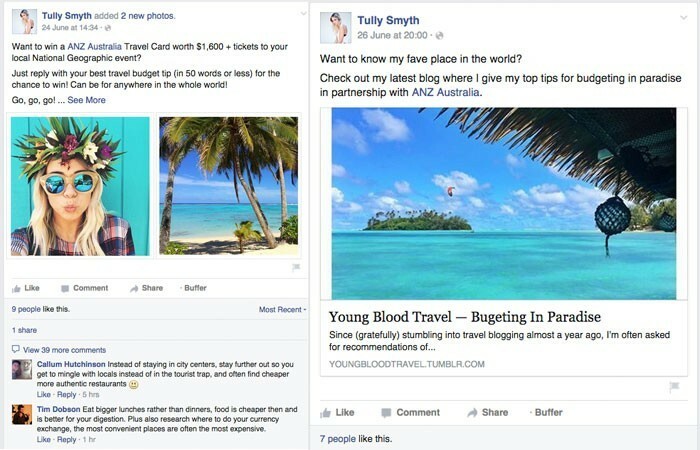 Even better they are simple to use with pre-defined templates for different kinds of Facebook ads. Of course, you should look at using these kinds of solutions to upload or create ads for other social media channels. Get the tone right – to make great travel videos to post on social media, you need to first think about who you are aiming the video at. Is it an older age group who will want more factual information, or younger viewers who want fun content that makes them laugh? Thinking about that will ensure you pitch your video correctly, with a style and tone that will make it work. It is also necessary to map out the structure of the video before you start so that the finished product has a coherent feel. Light up the screen – whoever you think will view your videos on social media, you need to always be a charismatic figure when on screen. If you present your videos in a boring and lethargic way, then no-one will want to view them. While that does not mean shouting or jumping around the screen, it does mean you have to have sufficient screen presence to hold a viewer’s attention. Make it interesting – in addition to you or anyone else who appears in the video being interesting, the actual content must be engaging. After all, even if you create a video that is bang on the money in terms of tone and performance, it will be useless if nothing of interest happens to keep people watching. Think about your equipment and camera – of course, before you edit your content with an online video making solution, you will need high-quality footage to work on. Shooting a great travel video will rely on the camera and equipment you use in many ways. While it is the skill of the user that ultimately determines how good the video will be, the camera you use does play a vital part. This is usually a personal choice as it is down to budget and to using equipment that you know how to get the best from. From GoPro to iPhone or DSLR camera, you need to work with what gives you the best results. Social media is great for posting travel content as it has global reach and millions of users. This can also make it difficult to get your videos seen as there is so much competition. However, by following the above tips, you will be able to plan, shoot and create a piece of travel video that your followers will love.